These are All-State style legal index tabs, pre-printed with letters. These tabs are available in letter size and legal size. Choose from tabs on the side, collated side tabs or the bottom of the index. 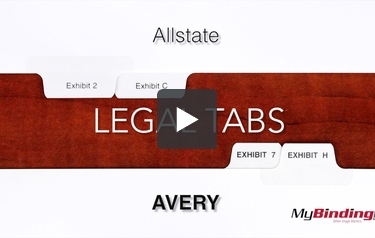 These are Allstate and Avery Style Legal tabs. First, the difference between Allstate and Avery is a variation of the same font. Allstate is plain helvetica, and basically all grammatical rules apply. But with Avery, the text is all caps and the font is bold. They are a lighter paper compared to normal index tabs, with a thickness of 80lb. Compared to the normal 20lb printer paper, it's still going to be thicker. On each is a clear mylar coating, making them a little more durable and it gives the tabs a slight sheen. You can find a huge variety of options including: Numbers from 1 to 2000. Different Variations of letters from A to Z. Exhibit Tabs, Roman Numerals, References, and blank tabs. The tabs are displayed on the side, or even on the bottom. Collated tabs come packaged in order - so if you get A-Z, then A will be on the top, Z on the bottom, and everything else in between. Or you can get the tabs uncollated: purchasing several of the same tab. Now, when you buy uncollated tabs, each tab is in a standardized position. So for example, if you buy an A tab it will be in the A position - and the B tab will be in the B position. The tab labels are printed on both sides, so you can easily search you pages forwards or backwards.